This is a website for the history and statistics of the Chesterfield Football Club. "Sky is Blue" stands independent of the Chesterfield Football Club although it is populated and maintained by long-standing supporters who have contributed to the club’s wellbeing over many years. Any views expressed on this website are those of the individual contributor and are in no way representative of the views of the Chesterfield Football Club, its players, staff, directors or supporters. This site is an official partner for the Heritage project of the Chesterfield FC Community Trust. More information about the Trust can be found by clicking on the logo. The links at the top of the page will take you to our site's various sections, which will be populated as time permits. Stats & records contains many detailed files on player stats, team-based stats and line-ups for every season, while a subsection named The Basics is a good starting-point for a general grounding in the club’s past. Written items about moments and events will be under the Articles link, while the Games link is self-explanatory. Our Biographies section will contain items on more than one hundred leading players, managers and club officials. We will aim to upload a rich and varied selection of Images from our archive. If you operate a history-based football site let me know and I'll add it to our Links. 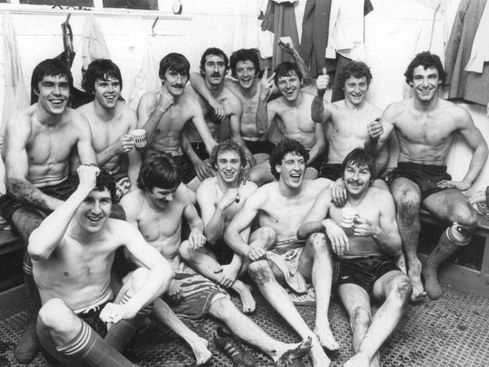 Photo: The team celebrates its 3-0 win over Rangers in the 1980-1 Anglo-Scottish Cup. You are most welcome to contact us with any query you may have. We especially welcome enquiries from the families of former players, whether they played five hundred fist-team games or forty-five minutes in a pre-season friendly! Can you see something we haven’t covered? Let us know, and we’ll have a go at it. We are happy for you to download linked files for your personal, non-commercial use - that is, for private study or research purposes. Please don't copy stuff wholesale and whack it up on your own blog, or whatever. If you write for a football magazine, a club website or programme and want to use anything on this site, please make some form of acknowledgement to "www.cfchistory.com" Since we are very much not in it for private gain, we most certainly do object to any of our stuff being used for commercial, business or private gain. If in doubt, please ask. Conversely, if we have infringed your copyright on anything it has been done accidentally; please let us know and we'll take stuff down, or acknowledge its source.